Texas history is already full of pretty rowdy tales. But one Austin-based author decided to make it a little rowdier with a work of historical fiction about Republic of Texas President Mirabeau Lamar and his rival Sam Houston. 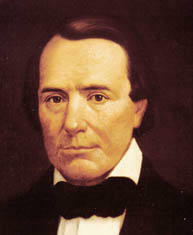 Mirabeau Lamar was intelligent and educated, but had a hard time keeping up with the appeal and charisma of his rival Sam Houston. Jeff Kerr has already written a couple of historical accounts about Austin and Texas history, including Seat of Empire: The Embattled Birth of Austin, Texas and Austin, Texas Then and Now. But he said the realities of the time and travel needed to thoroughly research another historical account steered him to fiction. I talked with Kerr recently about his novel Lamar's Folly, which chronicles the rise and fall of Lamar. Kerr told me the title comes from a literal folly – a short palisade Lamar had built around the Texas Capitol that was too short to keep anyone or anything out. But Kerr says Lamar's grander folly was his ill-informed desire to expand Texas into an empire reaching all the way to the Pacific Ocean. KUT's Jennifer Stayton talks with Austin author Jeff Kerr about his novel "Lamar's Folly"